The plot is a "dark" reworking of the original fairy tale, with Seven Dwarves named Napoleon, Half Pint, Grub, Grimm, Wolf, Butcher and Chuckles. What Madame L loved most about the movie was seeing Princess Snow take care of herself, without the help of the prince. But she also loved Julia Roberts as the stepmother, Nathan Lane as the brilliant and hilarious Brighton (some kind of chamberlain), Lily Collins as the luminous Snow White, and Armie Hammer as a presentable Prince Charming. Neil Armstrong is another person who made a difference in my view of the world and the universe. Madame L loved this book by Virginia Euwer Wolff, the author of "The Mozart Season." As in "The Mozart Season," this book is narrated by its young heroine. Unlike the narrator of "The Mozart Season," this 14-year-old girl, LaVaughn, does not have a loving support group of a family. She has her mother, who is a great mother, but her father, who was working hard to keep out of the deadly drug dealings and crimes of the neighborhood, was killed by a stray bullet when she was very young. So LaVaughn has her mother, and she has school. And then she has a job, babysitting for another teenager, Jolly, who has two children already. And if you thought LaVaughn had it bad, think of Jolly, who has lived in a box and who is afraid of getting any help from anyone because if she accepts that help, she believes, her children will be taken from her. LaVaughn is in a dilemma, and the adults around her are clueless. Her mother wants her to go to college, so she worries about the bad influence Jolly may have on her. The teachers in the "Steam Class" almost outright accuse her of taking advantage of Jolly by accepting money for babysitting for her. The school counselors suggest she can babysit for Jolly only after taking a class in how to babysit---after she has been tending the children for some time, and doing it better than Jolly herself can do it. Then, when LaVaughn finally talks Jolly into getting some help, getting into special classes for teenage moms, what do you think happens? Ah, Dear Readers, you'll have to read this book to find out. And, Dear Readers, you'll WANT to read this book for the pure beauty of it. How could Ms. Wolff get so thoroughly into the mind of a 14-year-old girl, the girl's own words and everything, and write it like a poem with chapters? Madame L does not know, but she thinks you'll be as amazed as she was. Madame L got "Make Lemons" on sale when her local Borders was closing, and you can get it from Amazon.com for $7.99, new, and various other prices, used. Madame L found out by checking this out on Amazon.com that it's the first book in a trilogy, so she'll be getting those books from her local library (free) or from Amazon.com (used); and then she will report on them. Remember that? Great scene from a fun movie, and it looks like a wonderful version of ratatouille. But, according to this article from Slate.com, this is the wrong way to make ratatouille. L.V. Anderson writes, "Ratatouille was invented by Provencal peasants, and Provencal peasants possessed neither the time nor the inclination to slice vegetables with such precision or to bake them as gently and slowly as possible. What they had the time and inclination for was stew." So, here's the recipe for the authentic Provencal stew. I'm sharing it here because I tried it last night for some dinner guests who on doctor's orders have gone vegan. I was worried about it because of my low success rate with past experiments with eggplant. But this worked, and it tasted great. 1. Heat the oven to 425°F. Toss the zucchini with 1 tablespoon of the olive oil and a little salt and pepper on a 13- by 18-inch baking sheet. Roast, stirring every 15 minutes or so, until fully tender and golden brown, about 30 minutes. 2. Meanwhile, put the remaining ⅓ cup olive oil in a large pot over medium-high heat. When it’s hot, add the onion and garlic and cook, stirring occasionally, until softened, 5 to 7 minutes. Add the eggplant and thyme, season with salt and pepper, and continue to cook, stirring frequently, until the eggplant is partially tender and has reduced considerably in volume, about 10 minutes. Add the bell pepper and continue cooking and stirring for another 10 minutes. I did make some modifications: I used a bunch of random "Italian herbs" instead of fresh basil and thyme leaves, I used a sweet Walla Walla onion instead of a yellow onion, I added a sweet banana pepper from my own garden, I used a can of jumbo black olives instead of the kind of olives the recipe calls for, and I put in a few dashes of spicy barbecue sauce at the end.Oh, and I served it with sparkling limeade from Trader Joe's (perfect!) and corn muffins made with almond milk (yummy! ); and fresh peaches for dessert (heavenly!). If you try the recipe, let me know how it works for you, and especially if you think of any more brilliant variations. But, you know what, I'm going to try Remy the Rat's version someday, too. Thanks to Neva for telling me about this talk about a Buddhist monk diagnosed with cancer, and what happened when he asked for, and showed, compassion. Enjoy! "Nothing is withheld from us what we have conceived to do." Check out this post about young whippersnapper Joel Runyon's meeting with Russell Kirsch, who invented the world’s first internally programmable computer. God and me, so I went out and did it. Now, check out this post about the 7 lessons Joel Runyon learned from the conversation. Here are the 7 things he learned---but you'll want to read the actual post. 2. You are not that important---be humble. 3. Details may make you right, but they'll probably make you miserable. 4. Don't complain. Fix it yourself. 6. Live a good story. 7. Most of all: Stop reading. Start doing. There’s a lot of things that haven’t been done yet that need you to go do them. Go. (I first read this poem when my niece Angela sent it to me, and I love it. It's my favorite poem for now (and for the past year or however long it's been since she sent it to me). After you read it, check out some of the other poems on the site. Tortilla Factory Closed? Oh No! But they've published online their recipe for salsa, the best salsa I've ever tasted. Madame L had no idea that a book titled "The Tulip Touch," which won the 1997 Whitbread Award for Children's Book of the Year, would be uplifting and interesting, yet it was neither. It was certainly intense, as the narrator (Natalie) falls under the spell of another girl at school, Tulip, who turns out to be bad for her in every way. Natalie's parents don't pay much attention to her, so she's left on her own to deal with Tulip's misbehavior. The title alone of "A Crooked Kind of Perfect" made Madame L smile. And, sure enough, the narrator, Zoe, has her share of problems at school and at home. Her parents also are too busy and preoccupied to pay her much attention, so she's also left on her own to deal with the ordinary problems of life. Fortunately for her, and for readers of this book, she doesn't have to deal with someone like Tulip. Linda Urban ("A Crooked Kind of Perfect") and Anne Fine ("The Tulip Touch") are writing for children of about the same age. They deal with the same issues of oblivious parents and teachers, mean kids, being popular, and having trouble with school. But they're worlds apart. Madame L found "The Tulip Touch" at her local library in the cart by the check-out desk of books recommended by the librarians. Yet she would never want a child she knows to read this book. It's dark and it deals with issues children should be figuring out by discussing them with their parents, not by reading them in a random book. The book ends, "But what about Tulip? I shall feel sorry for Tulip al my life. And guilty, too. Guilty." Come on, Anne Fine! This is too depressing for even the most masochistic adult! Why would anyone want their child reading such garbage? On the other hand, Madame L would recommend "A Crooked Kind of Perfect," which she bought on sale at Chinaberry.com for $3.95, would be a fun and uplifting read for anyone. The heroine starts to figure out her parents, the popular girls, and even a boy, who becomes her friend. And the book ends with her finally getting a piano. she says, "I don't care if my piano isn't perfect yet. I just want to play. And I do." Here's the short essay about different photos of male and female Olympics athletes which I mentioned earlier, which I couldn't find online when I was finishing that post because I was having problems with my computer. And here are the photos referenced in the article. "Close-range photographs of male basketball players’, hurdlers’, and swimmers’ torsos and glutei maximi look ridiculous. And yet that ridiculousness—the fact that I want to laugh when I see a photo zoomed in on a male gymnast’s crotch but don’t even think twice about seeing an editorial photo highlighting a conventionally attractive female athlete’s scantily clad behind—just underscores how inured I’ve become to sexism in the media. Jones’ simple, elegant technique highlights how thoroughly chauvinism pervades the images we mindlessly consume on a daily basis—during the Olympics, and every other day of the year." When I was in high school and we "had to" try out in all the track and field events, I remember thinking something like the following: Are you kidding me? Running around the track and jumping over those things? That's a great way to break your face! I thought it was just another torture our horrible P.E. teachers had dreamed up for us. (They certainly had a knack for taking whatever you had earlier thought was fun and interesting, and turning it into a hateful, stressful, and/or boring activity.) So I love watching the hurdlers in the Olympics because I think they must be the most admirable people on Earth (assuming they had the same type of high school gym teachers I had---and everyone does, right?) --- because they can even do that: they can run that fast and make it over those obstacles and make it look like it's fun and exhilarating. Sally Pearson of Australia won. Amazing! I've found the ideal way to watch the Olympics: DVR everything and then watch it all, hours later. It doesn't matter if the results are already available on the Internet, because if I care about the event, I'll watch it anyway, and if I don't, I fast-forward through it. I loved watching the women's water polo match today. (I don't even know when it happened.) It reminded me of the one time I ever played water polo, in a pool in Saudi Arabia, and I got the ball away from some big tough guy who tried to get it back by holding me under the water, thinking I'd eventually have to come up for air, and he'd get it. But Cory attacked him before it got to that point (and I surprised myself at how long I could hold my breath, out of pure obstinate refusal to let that guy get the ball from me!). Have you seen the beach volleyball? I guess it's a sport. I think it's hilarious how the women have to wear bikinis and then men wear T-shirts and baggy shorts. Oh, it's because the women LIKE to wear those bikinis? Not so! They're REQUIRED to wear them. And go to any website with coverage (ha, get it, coverage, ha, ha) of the Olympics with a discussion about those bikinis to see what people think about it. And thus we get to the issue of junk. Yeah, you know what I mean. Junk. Why do the (mostly, if not all, male) photographers zoom in on the butts of the women athletes, and not so much on the junk of the men? Wel, you and I and everybody on God's green earth knows the answer to that question. I found a website with a great slide-show of what it would be like if the photographers zoomed in on the men's privates. Can't find it now and with the formatting problems I'm having I wouldn't be able to provide the link, anyway, but it made me laugh. 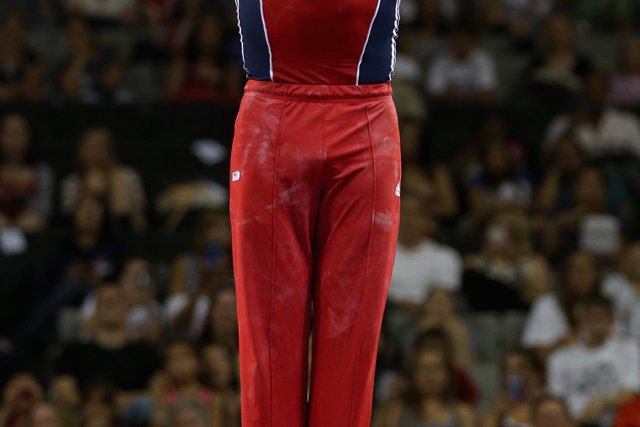 And here's the South Korean who won, doing his amazing vault. Notice how in his first vault, with a difficulty of 7.4, he doesn't quite "stick" it, but on his second, with a difficulty of 7.0, he does. You'll see all the gymnasts congratulate and hug him at the very end, but look at the huge smile Mikulak gives him (you can't hear his words, but he really did say, "That was ridiculous!" Please see Laura's blog for more on the Olympics. I'd write comments on her blog except that I can't. I love what she's written, and I absolutely agree with her about NBC's televising of the events and all the other issues she discusses. 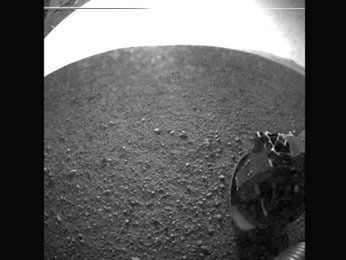 I couldn't wait to post this photo taken after the Mars rover Curiosity landed safely. I'm so glad NASA has decided to go back to Mars again, even though it's with unmanned missions. The little rovers are amazing, and I'm excited about what we'll learn from them, preparatory to sending humans to the beautiful Red Planet. And where should NASA be getting ready to go next? Best suggestion I've heard so far: Saturn's moon Enceladus, which is spewing jets of water and ice from its south pole. Groucho Marx once said, "I find television very educating. Every time somebody turns on the set, I go into the other room and read a book."